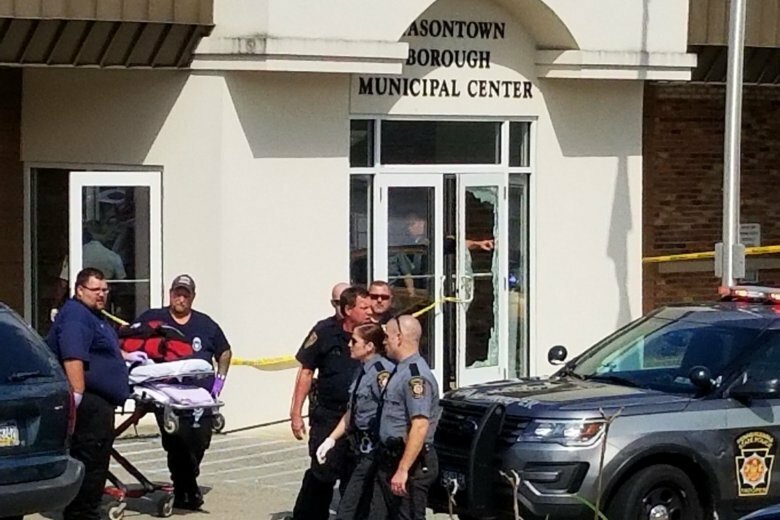 Fayette County officials say police shot and killed a gunman who opened fire in the lobby of the Masontown Borough Center. A Fayette County commissioner has confirmed the gunman who opened fire near a crowded Pennsylvania courtroom is dead. County Commissioner Vince Vicites said Wednesday he went to the judge’s office in Masontown after he heard about the 2 p.m. shooting because several county employees work in the magistrate’s court office. He was told the coroner was called to the scene because the shooter had died. It was unclear whether the shooter had been killed by police or by self-inflicted injuries or other means. A Fayette County 911 center supervisor says five people were injured and four were taken to hospitals for treatment. It was unclear if the deceased shooter was the fifth injured individual. A Masontown police officer sustained minor injuries in the shooting and was treated at a local hospital. A Fayette County 911 center official confirmed that one person had died in a shooting outside of a Pennsylvania judge’s office. The center official said dispatchers did not have any information about the identity of the deceased person. A supervisor earlier confirmed that at least five people were injured and four were taken to hospitals. Witnesses say the shooting happened around 2 p.m. Wednesday outside a county judge’s office near a crowded courtroom. State police have scheduled a news conference for 5 p.m. but have said the scene is secured. Officials did not say whether the shooter was injured or taken into custody. A witness says a shooting outside a Pennsylvania judge’s office started near a crowded courtroom. Joyce Royster tells WTAE there were hundreds of people inside the courtroom when the shooting started just outside. She says people fled the courtroom as the shooter started to move inside. Fayette County officials confirmed at least five people had been injured in the shooting around 2 p.m. Wednesday at the county’s municipal building. Four people were taken to hospitals including a police officer who received minor injuries. The Fayette County 911 center supervisor confirmed the coroner was called to the scene, but could not confirm whether there were any fatalities. State police say the scene is secure, but did not say whether the shooter was in custody or injured. A news conference is scheduled for 5 p.m.
Pennsylvania State Police say the scene is secure and no more threat remains at the office of a district court judge where at least five people were injured. A state police spokesman said on Twitter that no schools, businesses or offices are on lockdown as of about 4 p.m.
A Fayette County official confirmed that a coroner had been called to the scene after the shooting around 2 p.m. Two victims were flown and a third was taken by ambulance to a West Virginia hospital. A police officer with a non-life-threatening injury was being treated at a hospital in nearby Uniontown. It was unclear if the suspected shooter was injured or taken into custody by officers, but state police said the scene at District Judge Daniel Shimshock’s office had been secured. A Fayette County official says at least five people have been injured in a shooting outside of a judge’s office in Pennsylvania. The Fayette County 911 center supervisor says a coroner has been called to the scene and four people were taken to the hospital. Masontown Mayor Toni Petrus says one of her police officers received non-life-threatening injuries in the shooting that happened about 2 p.m. Wednesday at the office of District Judge Daniel Shimshock in Masontown, about 60 miles south of Pittsburgh. The supervisor says two victims were flown to a West Virginia hospital by helicopter and another was taken by ambulance. The police officer was being treated for hand injuries at a local hospital.